Oral history interviews provide tangible access to the past, with narrators offering first-hand descriptions in their own voices of historical events, ideas, and mindsets. The SOHP, in collaboration with Carolina K-12, is pleased to offer lesson plans on teaching about the American Civil Rights Movement through oral history clips. The lessons, created in collaboration with the 2017 Carolina Oral History Teaching Fellows, are available below and offer a unique way to bring history alive for middle and high school students. Despite the vastness and diversity of Appalachia, the term is often associated with cultural aspects that are not inclusive of African Americans. In this lesson, students will explore black life in the mountains, first through the lens of “Affrilachia,” a term coined by black Appalachian poet Frank X Walker. Through the exploration of poetry and music, students will gain an understanding of the important role African Americans have played in mountain culture. Students will further explore the various experiences of African Americans living in the North Carolina Mountains by listening to oral history interviews from the Southern Oral History Program, covering topics from daily life to the impact of the Civil Rights Movement. Students will culminate their learnings by creating a performance piece about black life in Appalachia from oral history interview excerpts. Access the lesson plan and the accompanying PowerPoint. Students will explore education during the Civil Rights Movement through the examination of oral history interview excerpts, selections from “Freedom Schools” newspapers, poetry, and discussion. Incorporating reading, writing, speaking, listening, and language goals, this lesson will lead students to reflect on the importance of education and access to quality education in terms of personal growth, fulfillment and equality. A Durham, NC native, Pauli Murray (1910-1985) is a lesser-known civil rights trailblazer whose life, activism and constant courage in the face of adversity made societal advancements that impact us today. The intersection of her crucial work also serves to illuminate the connections between the struggle for civil rights and women’s rights. This lesson will provide an overview of Pauli Murray’s incredible work, perseverance and accomplishments through class lecture and interactive discussion, and most importantly, through her own words. 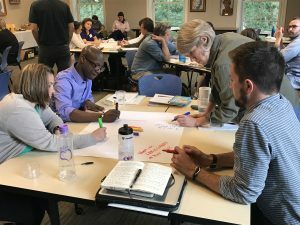 Infused throughout the lesson are seven oral history clips from a 1976 interview with Pauli Murray, housed at UNC-Chapel Hill’s Southern Oral History Program. This lesson will ultimately broaden student understanding of the Civil Rights Movement in terms of the heightened challenges (and thus fight) faced by African American women, as well as bring to the forefront one of the most impactful trailblazers for civil and women’s rights. In this lesson, students will examine the fight for African American voting rights during the 1950s-60s through a PowerPoint discussion, readings, and oral history excerpts. Students will learn about the various barriers to voting that African Americans faced, the ways in which people fought to expand voting rights, and the ways in which the expansion of voting rights affected political representation in the United States. This lesson culminates with an activity in which students are tasked with creating a skit for a new Voter Education Project with the goal of educating Americans about the fight for voting rights and increasing voter registration and turnout. This lesson will focus on how students of Historically Black Colleges and Universities created a culture of change and resistance that impacted the Civil Rights Movement within America. Utilizing varied sources, such as clips from the Southern Oral History Program’s recordings, film clips, articles, primary source documents, and various websites, students will work independently to discover how the agency and actions of HBCU students led to tangible social change, both in the areas surrounding their schools and across America. Students often have the misconception that voting was always a right for everyone over the age of 18. Further is the misconception that all former slaves were granted the right to vote following the ratification of the 15th Amendment. In this lesson, students will look at perspectives of those who, in actuality, did not receive the right to vote because of various methods of disenfranchisement. Through analysis of oral histories and other primary sources, students will understand how voting rights were taken away from African Americans in the South. History has often been remiss in overlooking the crucial leadership and contributions of women during the Civil Rights Movement, focusing instead on the more prominent male leaders. In this lesson, students will explore the important roles women played in the acquisition of civil rights as participants, organizers and leaders, particularly focusing on four examples: Septima Clark, Ella Baker, Daisy Bates and Fannie Lou Hamer. Through the examination of various readings, video clips and oral history interviews with and about these women, students will gain the understanding that without women, the Civil Rights Movement could not have been as successful. Students will culminate their understanding by writing ode poems about the women involved in the Civil Rights Movement. Access additional civil rights lessons that integrate oral histories here. Visit Carolina K-12’s Database of K-12 Resources for hundreds of lessons and PowerPoints on numerous topics at http://k12database.unc.edu. The Carolina Oral History Teaching Fellows program is a collaboration between the Southern Oral History Program and Carolina K-12. Funding for this program is provided by the Southern Oral History Program, the North Caroliniana Society, the College of Arts & Sciences, and the Graduate School’s Bland Fellowship. If you have any questions, please email Christie Norris at cnorris@unc.edu.